The recent Hollywood film Hidden Figures presents a portrait of how African American women shaped the US effort in aerospace during the height of Jim Crow. 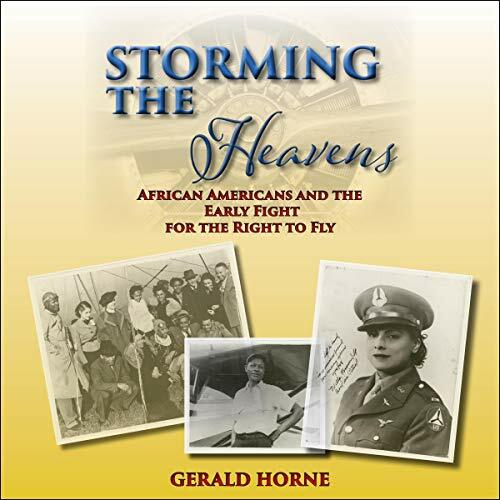 In Storming the Heavens, Gerald Horne presents the necessary back story to this account and goes further to detail the earlier struggle of African Americans to gain the right to fly. This struggle involved pioneers like Bessie Coleman, who traveled to World War I-era Paris in order to gain piloting skills that she was denied in her US homeland; and John Robinson from Chicago via Mississippi, who traveled to 1930s Ethiopia and became the leading pilot for this beleaguered African nation as it withstood an invasion from fascist Italy, eventually becoming the personal pilot of His Imperial Majesty, Haile Selassie, and a founder of Ethiopian Airways. Additionally, Horne adds nuance to the oft-told tale of the Tuskegee Airmen and goes further to discuss the role of US pilots during the Korean war in the early 1950s. He also tells the story of how and why US airlines were fought when they began to fly into South Africa - and how planes from this land of apartheid were protested when they landed at US airports. This is a topic I had not thought about before. I was aware of the Tuskegee Airmen but I thought it was just the United States Army that would not let black men fly military planes. I was surprised to learn that in the early days of flight black people were prohibited the right to fly. These black men and women had to go to Europe or Africa to learn to fly and be employed as pilots. The author tells the story of the early black aviators such as Bessie Coleman who went to France during WWI to learn to fly. Home also tells in detail the story of John Robinson who left Mississippi and traveled to Ethiopia in the 1930 to learn to fly. He fought against Italy when they attacked Ethiopia. He was the pilot for Emperor Halle Selassie and then went on to found the Ethiopian Airways which still exist today. Home also tells of the battles black pilots had to fight to be employed as pilots in the United States. The author also briefly reviewed the list of black aviation inventors and their contribution to aviation. It is yet another shameful story of our country. The book is six hours and thirty-eight minutes. Bill Andrew Quinn does a good job narrating the book. Quinn is a voice-over artist and well-known audiobook narrator.